Today's Florida Real Estate provides a unique and friendly way to search for Real Estate, Homes and Condos for sale throughout Florida. Experience a better way to explore Florida Real Estate. You'll find FL Maps, City Searches, Pictures and descriptions of listing information provided by Real Estate Agents, their Brokerages and the MLS. 8,206 Properties Found. Page 1 of 274. 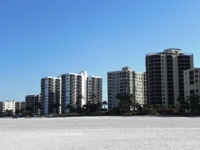 Fort Myers Beach Condos for Sale. Some of the very best locations on Fort Myers Beach have condominium communities, built to varying sizes and specifications by intrepid investors. The beaches of Florida are undoubtedly one of the most important considerations that people have in mind when they're shopping for a home or condo, most of the condominium locations have been built to offer excellent views of the beach and the Gulf of Mexico. In fact, even the condos built inland from the waterfront tend to offer outward-facing views of Fort Myers Beach or Estero Bay. Barefoot Beach, located within Bonita Springs, Florida is one of the most coveted beach front communities in all of the Florida Gulf Coast. There are a number of things that makes Barefoot Beach real estate so special when compared to other parts of Florida, including the natural beauty, exclusivity and activities the community has to offer. When looking for any real estate in southwestern Florida, being close to the water is one of the main priorities for many, and yet, finding these properties can truly be like searching for a diamond in the rough. However, when looking at Barefoot Beach homes for sale, it is very easy to see that every home, from estate homes, to villas and even condos are spectacular. Bonita Springs Condos for Sale - This area is also known for having front row access to one of the very best things about Southwest Florida, those amazing Gulf Coast sunsets. Many of the Bonita Springs Condos will have expansive views towards the ocean to be able to catch that sunset every night. And, because Bonita Springs has access to both the Gulf and the Bay the number of waterfront homes in this community are much higher. With many of the local parks listed as some of the top rated in the country, residents are certainly spoiled to have the option of seeing dolphins and manatees at Lover's Key State Park, and spend hours snorkeling at Barefoot Beach Reserve Park. Bonita Springs Homes for Sale - What makes Bonita Springs special has to be it's very unique waterfront location. Virtually surrounded by water, residents of Bonita Springs have access to not only the Gulf of Mexico, but also Estero Bay and the Imperial River. This allows many residents plenty of access for sailing, boating, kayaking, stand up paddle boarding and the like. So, it's no wonder that there are so many water sports enthusiasts who decide to live in this area. If owning a boat that can be taken out daily to fish or sail has been a dream, Bonita Springs could provide the perfect opportunity. Cape Coral Condos for Sale - Enjoy the comfort of living right on the waterfront with top-notch amenities and enviable luxuries when you choose from among the variety of condominiums. This desirable Southwest Florida city is famous for its hundreds of miles of canals, some of which include nearby properties of condominium homes with direct access to the Gulf of Mexico. Along with some condos that feature boat docks and boatlifts, complimenting the luxury of a boating lifestyle, many of the complexes and high-rises also include community swimming pools and spas plus fitness rooms and other added features. Cape Coral Homes for Sale As one of the fastest growing cities in the United States and the largest city in Southwest Florida, Cape Coral offers residents the best of both worlds. It has a world class metropolitan area, filled with a variety of lifestyle and entertainment options including yearly art festivals, an Oktoberfest celebration, and a renowned Fourth of July parade. The Cape Coral area offers plenty of entertainment venues from Country Dance Nightclubs and Restaurants as well, in addition to a number of waterfront establishments. Captiva Island Condos for Sale - What might be most incredible about Captiva Island are the beaches. Taking a barefoot stroll on these white sandy beaches will have you feeling like you're on a secluded tropical resort in the Caribbean. Most visitors and residents are hard pressed to find better beaches with crystal clear turquoise waters right out their front door. Being located right on the Gulf of Mexico, visitors and residents of Captiva Island are truly spoiled with some of the most spectacular sunsets seen anywhere. Captiva Island Homes for Sale - People choose to move to Captiva Island for a number of different reasons; many are first drawn in by those beautiful sandy beaches and the incredible weather, only to realize Captiva Island has a number of incredible amenities and benefits for families, as well as those looking for a vacation home. Between all of the recreation options, the delicious restaurants, and the world class shopping, after a few visits to the area, Captiva Island is hard to leave! It's no wonder so many are looking at Captiva Island real estate in order to turn that laid back lifestyle so common on vacations to a permanent feeling. Fort Myers Homes for Sale When it comes to real estate, Fort Myers offers many diverse options for you to choose from. From beautiful waterfront and beachside high rise condos to beautiful single family homes and vast luxury estates, Fort Myers real estate has a little something for everyone it's a city full of character, gorgeous views of The Gulf of Mexico, luxurious high-rise condos, single-family homes, and towering estates, all of which come together to make this the perfect city to live in. It has a real estate solution for every budget and lifestyle in. Fort Myers have plenty of condos available off the main drag. There are high rise condos available for everyone, no matter what your budget or your lifestyle requirements. Whether you are a single person looking to take advantage of the incredible nightlife offered by Fort Myers, Florida, or a couple looking for romantic privacy, or even a small family looking to take advantage of the benefits of homeownership without the hassle of expensive maintenance tasks, Fort Myers high rise condos for sale may offer you exactly what you are looking for. Fort Myers Beach Homes for Sale - The biggest draw to Fort Myers Beach are the beaches themselves. The area is home to those beautiful beaches Florida is famous for, with miles of soft white sand, perfect for sun bathing, reading a favorite book, or building a monster sandcastle, and don't be surprised if you encounter a dolphin or two just off shore.The beach also has a family friendly pier and boardwalk area filled with little shops and some of the best Fort Myers Beach restaurants around. You'll find many visitors and locals alike who spend time on the pier each evening taking in those famous sunsets Fort Myers Beach residents are treated to each night. It's no wonder why having water view Fort Myers Beach real estate is so coveted, after a sunset or two, it's easy to become a convert. Marco Island Homes for Sale is located due south of Naples, Florida and is West to the Florida Everglades. At only four miles long and six miles wide, it is a little sliver of paradise right off the sunny Florida coastline nestled on the Gulf of Mexico. What makes Marco Island so special is the fact that it has so many properties right on the water. The reason for why there are so many different and distinct waterfront properties on Marco Island because the island has a number of canals that weave through it, a truly unique feature. Marco Island Condos for Sale. There are many options when it comes to condominium community living in Marco Island Florida. With the miles of canals and waterways throughout Marco Island gives those seeking a way to get out on the water endless possibilities. One of the most convenient ways is to purchase a condominium that has a boat dock and/or a marina. There are also many communities that are located along the white sandy beaches of Marco Island giving beachcombers the ability to enjoy the Gulf of Mexico with it's wonderful beach sunsets. 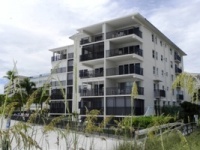 Naples Florida Condos for Sale. Naples has a variety of condominium designed for a variety sophisticated lifestles. There are lavish luxury condominiums with high ceilings and large square footage that open to the Gulf of Mexico to condos that include boat docks and marinas for the avid boater. There are also condo communities situated on the beach, providing beach access for those looking to take in the beautiful southwest Florida sunshine and romantic sunsets. There are also gated golf condominium communities designed by some of the best golf course designers in the world. Naples Florida Homes for Sale - With its beautiful white sandy beaches, incredible ocean breezes, and absolutely gorgeous sunsets, Naples is one of the top destinations in Florida for anyone who's looking to live a more comfortable and exciting life. Located right on the Gulf of Mexico. The culture of the Naples area is as bright and sociable as the beaches themselves, with a focus on aquatic activities that everyone from young children to retirees are able to enjoy. Naples Real Estate will give you quick and easy access to locations like the Von-Liebig Art Center and the Naples Philharmonic Center for the Arts, while a desire for a little more activity can be sated with golfing, boating, snorkling, relaxing in the sun and a variety of dining and entertainment venues. North Fort Myers Condos for Sale - North Fort Myers also enjoys a wide selection of exclusive high rise, Mid Rise and Low Rise condominium communities, which allow individuals and couples to enjoy living in luxury whether they choose to buy a condo right on the Caloosahatchee River or further off the beaten path. 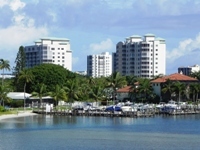 North Fort Myers condos offer waterfront living for less than other Southwest Florida condo communities. These units offer residents the same financial benefits of homeownership without the hassle of lawn or building maintenance. Right across the river is The Fort Myers Downtown River District is just one of many attractions that this beautiful waterfront city has to offer its residents. North Fort Myers Homes for Sale - For those who enjoy spending lots of time on the water, North Fort Myers offers a host of boating communities. These homes are situated close to the water and offer amenities such as private boathouses and slips as well as a close proximity to marinas. Boating communities in Fort Myers are plentiful with each community offering something distinct and different from all the others. This ensures that there is a perfect community for every type of boater. Sanibel Island Condos for Sale - If you've ever dreamed of living on a gorgeous island where your life consists of sitting in white sands as crystal blue waves crash to shore, palm trees sway around you, and the warm sun shines down on your face, then Sanibel Island is for you. The island isn't located in the middle of the Caribbean, but rather right off the Southwest Florida coast, and the best part is that it doesn't just have to be your vacation destination. What really makes this little piece of paradise an ideal place to live is the extensive amount of activities to do whether you want to stay on land, play in the sand, or get out on the water. Sanibel Island Homes for Sale - All of the benefits that Sanibel Island offers to residents make it such a desirable area on the Florida Gulf Coast. Between the beautiful beaches littered with sea shells and the incredible sunsets, the championship level golf, delicious oceanfront dining and local shopping, the island is a truly magical place for anyone to live and work. Sanibel Island residents are privileged to benefits like beautiful sunsets, colorful seashells, excellent fishing and delightful weather all year round. What sets some of the Sanibel Island real estate apart from other areas of Florida is the fact that, by being a barrier island West of Fort Myers and just North of Naples, it is home to a number of unique features.